While Washington spins, here is the real alert. We may be in a rapid shift of warming on Earth. 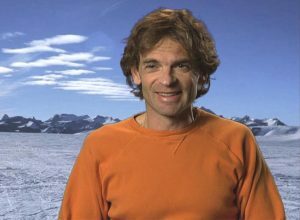 Interviews with top ice scientist Eric Rignot on Antarctic ice rush; Yangyang Xu – fast heat from air cleanup; and Julio Herrera Estrada on super drought science. 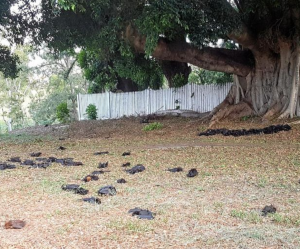 Bats and birds are dropping dead out of the sky from the heat. Millions of fish died. Crops are damaged, and more humans will die from heat. Here in the Pacific Northwest, December was 3 degrees C, over 5 degrees Fahrenheit warmer than normal, day and night. The U.S. South and East have been battered by storm after storm, as has California. The Polar vortex split, spattering bitter cold into pockets around the world for short periods, including the U.S. Northeast and Canada where temperatures went up and down as much as 27 degrees in a single day. London was set for “Thunder Snow”. We are in climate disarray. I am on the phone with scientists trying to find out why things are jumping instead of ramping up more slowly. Last week I covered new science titled “Global warming will happen faster than we think.” Grab that if you missed it. This week I talk with the lead author of that paper, Yangyang Xu. We zero in on the way a cleanup of air pollution, particularly in China, may be revealing hidden heat built up over decades of fossil fuel emissions. Later we will explore the way warming makes big droughts worse, with scientist Julio Herrera Estrada. But first, we get a briefing from Eric Rignot, Senior Research Scientist at NASA’s Jet Propulsion Lab, and one of the top ice experts in the world. Eric has more staggering news, this time from Antarctica. 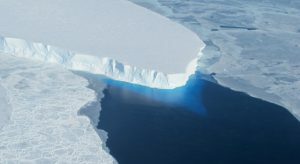 Here is the latest shocking headline in this age of climate change: “Antarctica losing six times more ice mass annually now, than 40 years ago”. To explain the breaking science we are joined by Dr. Eric Rignot, Chair of Earth System Science at University of California, Irvine, and Senior Research Scientist at NASA’s Jet Propulsion Laboratory in Pasadena. Just 10 years ago we were told “don’t worry about Antarctica“. Sea ice there was actually expanding. We thought snow was piling up deeper in the interior of the continent. But satellite measurements show Antarctica is losing mass. Ice must be peeling off into the ocean faster than snow can accumulate. In 2014, Eric and his team shocked the world when they reported melting in a section of the West Antarctic Ice Sheet is “unstoppable”. In this paper, and in this interview, we discover it is not just the Western part going. East Antarctica, which holds enough ice to completely rewrite world coastlines, is also losing ice. After an exhaustive survey, this team found in the 1990’s, ice loss from Antarctica more than tripled from the previous decade. It’s gone up again every decade since. We also discuss the role of the ozone hole and climate change. Look for my follow-up interview with Antarctic specialist Dr. Richard Levy from New Zealand in an upcoming Radio Ecoshock show. There is more amazing (but frightening) new science to come. YANGYANG XU – A BURST OF FAST HEAT FROM AIR CLEANUP? You have seen pictures of crowds in Chinese cities with masks over their faces. The smog of rapid industrialization is thick, but Chinese authorities are working overtime to clear the air. But will air pollution get better or worse in a hotter world? Could cleaner air actually heat the planet? It’s difficult to get the latest on the situation in China. But we’ve reached one of the best young scientists working on it. Dr. Yangyang Xu was educated in Beijing. He came to America to study with the legendary Ram Ramanathan at the Scripps Institution in San Diego. Now Yangyang is an assistant professor at Texas A&M University. He has already published 30 papers, with more in the works. I want to begin by saying this discussion is not against China. Air pollution is a problem well-known in many countries. Chinese the authorities are struggling to resolve it quickly, without damaging the economy. This science is part of that. Let’s start with some basics. We know what the global average for carbon dioxide pollution is this year. Is there a similar global count for aerosols? Not really, pollution so regional that a global number is not helpful. In January 2019, Yangyang coauthored a paper predicting worse pollution for East China due to increased greenhouse gases. The can haze get worse, even as the government tries to clean up – because climate change disrupts weather in a way that favors the continuation of pollution. For example, yes there will be more extreme rainfall events, which do clean up the air. But there will also be more dry days in between, with wind patterns in Eastern China that do not disperse pollution well. We discuss the relationship between air pollution and extreme rainfall events, in the past 30 years, and in the future. Dr. Xu co-authored an ambitious study, published in July 2018, attempting to explain the impacts of aerosols on rainfall, not just in China, but over Asia generally, including India. I recall a talk in the early 2000’s by Ram Ramanathan. He said evaporation of water from pans showed a decline of about 9% in the amount of sunlight reaching the ground in Eastern China. The impacts of reducing the amount of sunlight reaching a large country are profound. Surely agricultural production would be hurt, as well as plants and animals in the wild. Isn’t that an addition cost of smog, beyond the health impacts on humans? In the winters of 2013, 2015, and 2016, China experienced something like smog storms. Industry had to be shut down, and car traffic slashed, but the government is very aware of the problem, and citizen demand for a cleanup. Ironically, cleaner air will mean more global warming, as there are fewer aerosols to reflect sunlight back into space. We covered that last week in the interview with David Victor. Cleanup up the air is one of three reasons “Global Warming Will Happen Faster Than You Think”. It would be ironic if humans stop polluting the air with sun-reflecting sulphates, but then feel forced to spray more sulfates in the Arctic or stratosphere to cool the planet back down. Do you think geoengineering will be necessary? Terrible droughts driven by climate change can increase greenhouse gas emissions in an unexpected way. When the reservoirs at electric power dams run low, utilities make up the difference by burning more fossil fuels. In a new case study of the American West, the extra emissions are significant. That is just one part of the big story emerging as the world warms. Our guest is a drought specialist from Stanford University’s Department of Earth System Science. Julio Herrera Estrada is a Postdoctoral Scholar with published research on droughts in Mexico, the United States, and Africa. His Pd.D. thesis surprised me. I thought drought appeared in one place, and then perhaps in another region, but Julio’s research shows droughts can travel. We talk about Julio’s recent paper “Response of electricity sector air pollution emissions to drought conditions in the western United States.” That was published December 21st, 2018 in Environmental Research Letters. Drought drives electric utilities to emit more emissions in two different ways. First giant power dams lose water capacity during a drought. Second, when water power is not available, some western states kick in natural gas generators, while others turn to coal. That make a significant difference in emissions. A 2016 Technical report from National Renewable Energy Laboratory found “43 incidents of water-related power plant issues from 2000 to 2015… These incidents occur throughout the United States and affect coal and nuclear plants...” Drought can drive shutdowns of fossil fuel or even nuclear power plants. When we think of big water users, it’s usually agriculture. But that NREL report says about 41% of all water withdrawal in the U.S. is for the thermal electric power industry. There are two factors leading to shutdowns (a) there is enough water but it is too hot and (b) there is not enough water. A January 2016 Letter in Nature Climate Change, led by Michelle van Vliet, found, quote, “reductions in usable capacity for 61–74% of the hydropower plants and 81–86% of the thermoelectric power plants worldwide for [the period] 2040–2069.” Drought will be one factor in that. In the February 2015 issue of Science Advances, Benjamin Cook and his co-authors published the ominous paper “Unprecedented 21st century drought risk in the American Southwest and Central Plains“. They suggest coming mega-droughts worse then records measured for Medieval Times. Most people do not realize our current society is still a hydrological civilization. We collect water in the spring to irrigate farm lands during the growing season, for water power, and for water hungry cities. Is it possible some parts of the planet will become less viable simply due to irregular and unpredictable water supplies? You can help educate everyone you know, and the world, by forwarding links to the Radio Ecoshock shows and interviews. Help me get the voice of the scientists out as far as we can. My special thanks to the dozen listeners who came through last week to help support this program. I have the best listeners. Thank you, and let’s do it again next week. Hi Alex, got my dose of science for the week. thank you, a particularly information rich session. Send you a $40/month regular subscription too. I’m still wishing you could introduce a question to climate scientists on every show what they know about Garrett Relation. It really needs to get higher profile cuz it really impacts policy options.